The world’s largest container company will start looking for takeover targets outside the shipping industry as it tries to pre-empt a new competitive landscape in which customers are morphing into rivals. Jakob Stausholm, A. P. Moller-Maersk A/S’s chief financial officer and head of transformation and strategy, says the company needs to expand its land-based activities to meet a growing need from clients. “We’re currently very big in the ocean segment, and we’d rather grow in non-ocean, so it may be a good idea to look for M&A targets there,” Stausholm said in an interview Tuesday. Buying land-based activities would mark a shift from the kind of consolidation Maersk and the industry have targeted in recent years. The Danish company, which is in the middle of offloading its energy business and last year completed its acquisition of Hamburg Sud, now has 20 percent of the container shipping market. Maersk says it wants to be part of further consolidation, but analysts warn it may face regulatory hurdles. Now, Maersk is expanding its competitive universe to include different types of companies, including couriers like FedEx Corp. and UPS Inc., the CFO said. The CFO declined to identify what specific parts of the land-based logistics chain Maersk may target for takeovers. 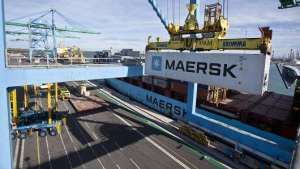 He also said it may take some time before Maersk makes such acquisitions because the Copenhagen-based company is still focusing on getting its transport units to work more closely together. Starting this year, Maersk will report revenue based on its ocean and non-ocean operations, with the latter including the logistic service activities and the port terminals. In 2017, non-ocean revenue made up about 28 percent of Maersk’s sales.